Hi friends! Hope you had a great weekend! Those of you who “Liked” my Facebook page probably realize I have been a cooking fool the last few days… This is kind of unusual because just take a look at the title of my blog “Weeknite Meals”, you should have figured out I don’t normally hang around in the kitchen during the weekends. Though the past weekend was special, because August 8th is Father’s Day at Taiwan, but I had a jam packed schedule so I didn’t get to take my Dad out for a carb. loaded lunch. Why carb. loaded you asked? Well my Dad is originally from Northern China (Beijing to be exact), and he grew up eating all kinds of doughy goodness! Though now my parents are older, and they are very careful with healthy eating, so most of the time they keep the carb. intake pretty low. This is why when there’s a special occasion for my Dad, I like to take him to restaurants that serve the familiar Northern China goodies. This year I really wanted to try my hand at making him something, since home made food always feels more special, and not only did he get to enjoy the green onion pancakes, all my nieces and nephews were very excited with this little treat, it made me very happy to see a whole room full of stuffed smiley faces! Mix salt, white pepper and black pepper in a small dish, reserve aside. In a large bowl mix flour with 1/2 cup of water and stir until water is absorbed. 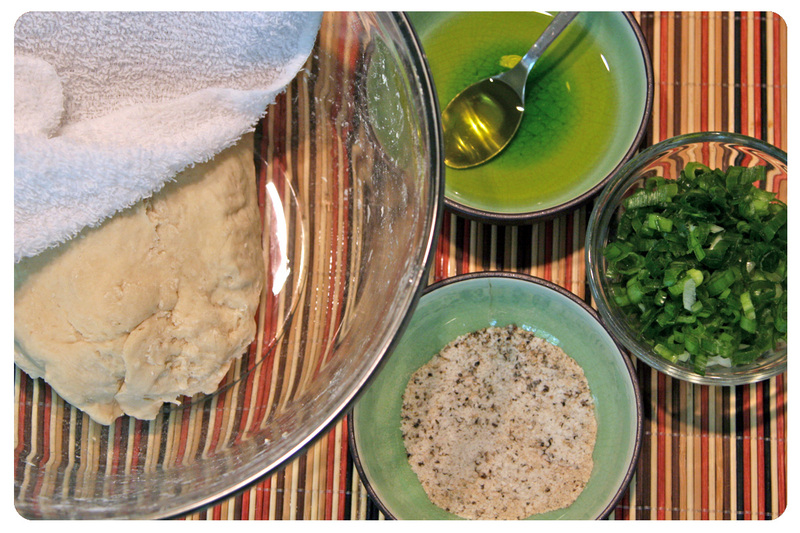 Continue adding water one tablespoon at a time and mixing thoroughly until dough pulls away from sides of bowl. We want a firm dough that is barely sticky to the touch. Knead the dough about until smooth then cover with a damp towel for 30 minutes. Take the dough and form a flattened dome. Cut into 10-12 pieces of equal size. Roll the pieces into balls. 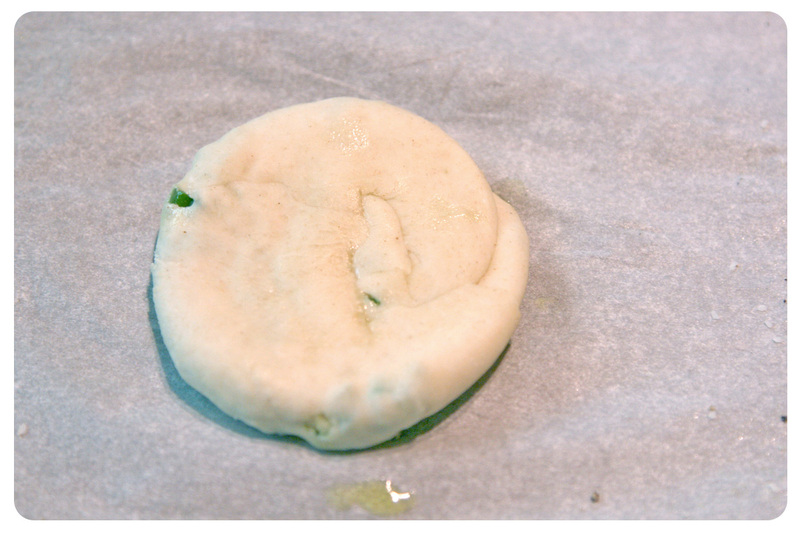 Place a ball of dough on a well-floured work surface and roll out into a thin circle (about 1/16th inch thickness). Spread a little of oil evenly over the pancake (use more if needed). Sprinkle salt and pepper mix evenly over the pancake. 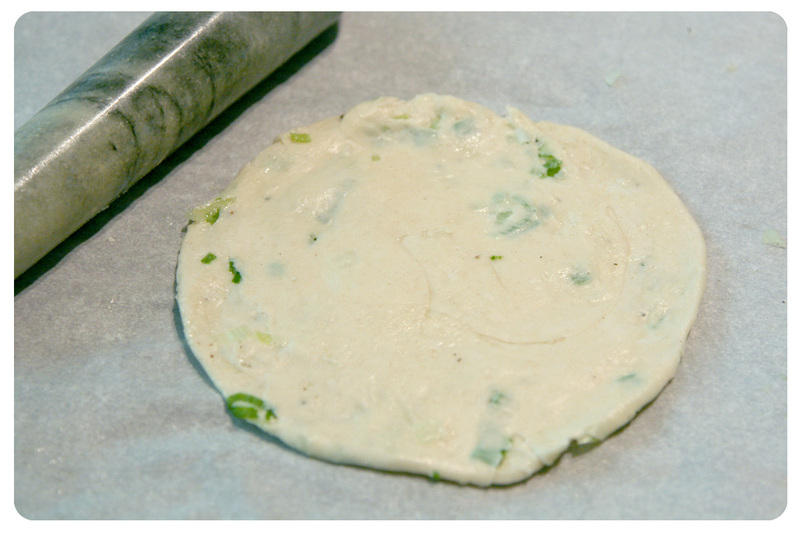 Sprinkle green onions over the pancake. Roll the pancake up from one end like a rug, then curl the roll around in a spiral and pinch the end to the roll so it stays wrapped. 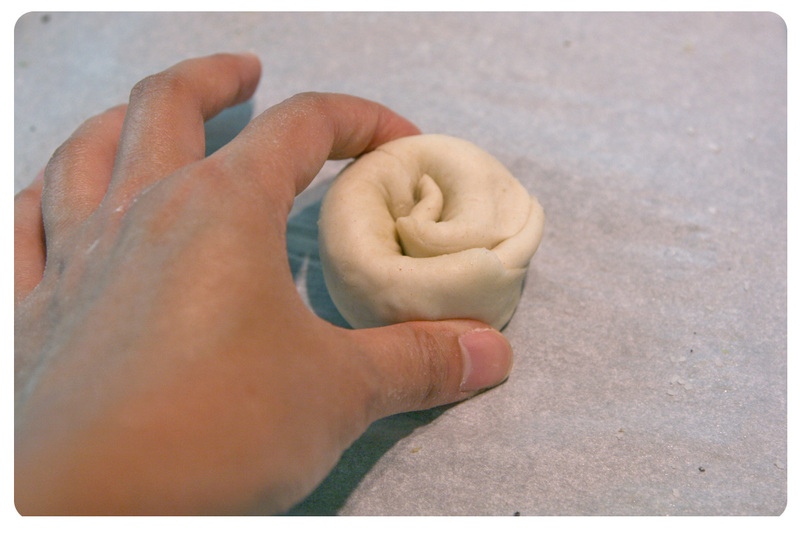 With the palm of your hand, press the roll from the top to flatten it. 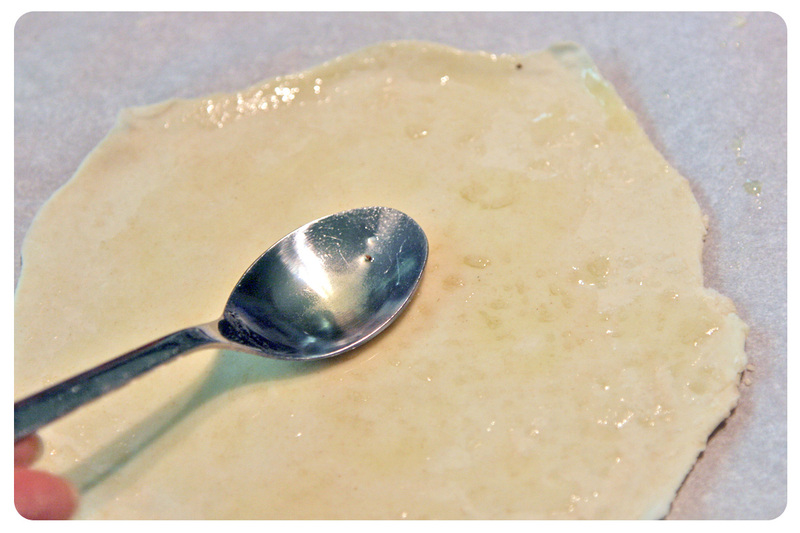 Roll the pancake out to 1/8th inch thickness. Heat a tablespoon of oil on a flat, wide pan over a medium-low to medium flame until hot. Set the pancake in the oil and let fry until the bottom is crisp and golden. Flip the pancake, adding more oil as needed. Remove from heat and serve immediately or reheat in the toaster. Jeno, I wouldn’t say no to a meal in a Northern Chinese restaurant either! The doughy things like dumplings or buns or thick pancakes are irresistible. (Even in Indian restaurant I order only naans, never rice because I think if I have carbs, then I choose the ones I go crazy for). Your pancakes look fabulous and quite easy indeed. (You know you can use a long thin bottle instead of a rolling pin). Were they crunchy or soft? Or maybe both? (I get hungry even trying to imagine the texture). I prefer the wooden rolling pin because somehow I feel the flour “sticks” better to it (the surface is not so smooth) and you don’t have to keep on sprinkling it all the time. It’s also not as slippery. In general I like wooden tools in the kitchen (of course as long as they are efficient). I love Naans Sissi! 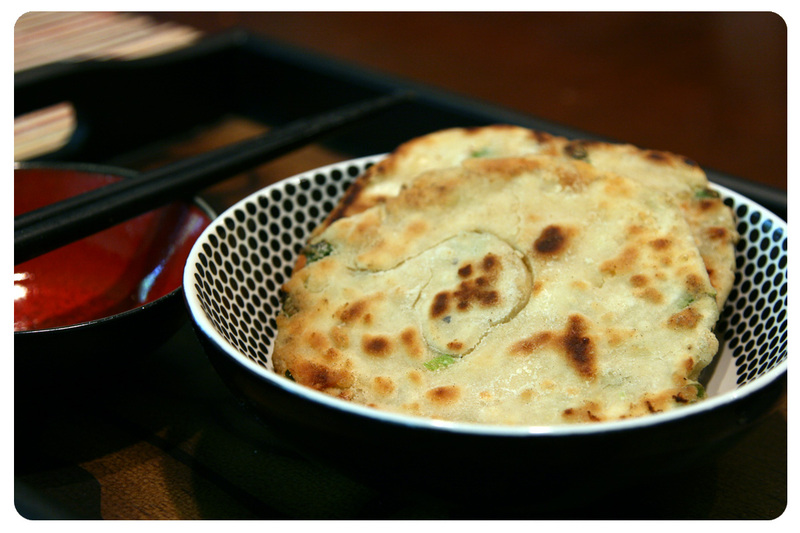 The consistency is very similar to green onion pancakes, chewy and delicious! I find that hand made flour tortillas is an awesome carb addition to meals also, so delicious! I think I will most likely purchase a wooden rolling pin, my Mom tried to give me one of hers, though I know her and my Dad make Northern goodies together, so I did not want to take it away from them. Thank you for the tip! Hi Lyn! I thought most Chinese speaking country celebrate Father’s Day on August 8th? 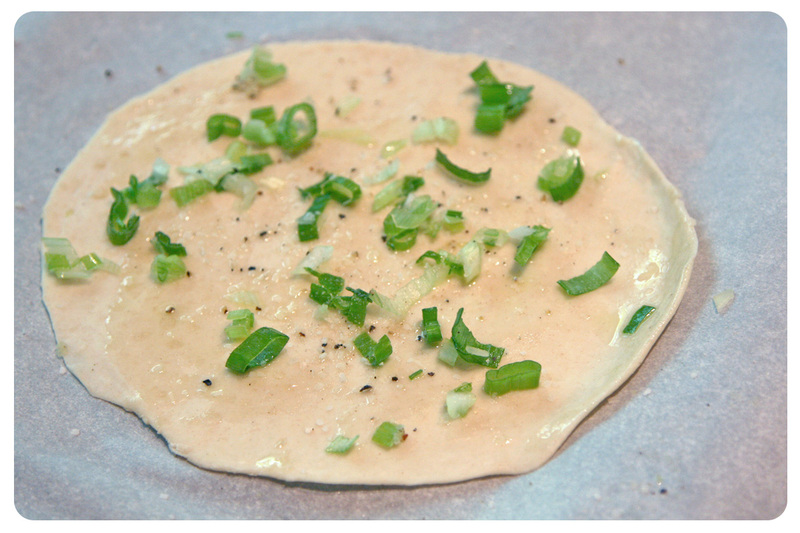 The green onion pancakes are actually called 葱油饼, I will make them thicker the next time around, maybe double the amount and freeze some for future cravings! Yes I love reading your FB postings about family celebrations and food you made to show your loved ones how much you care! ooh, those sound delicious, Jeno! There’s nothing like some carbs to cheer you up! So lucky to have your dad around to spoil. I love pancakes, but since the kids left home…. don’tdo them anymore. But these look inspiring, cos I much prefer savoury. Hi Jenny! YES, eating carb always makes me feel so happy… But then the regrets set in if I overdid it! I would take savory over sweet treats any day also! This is a great snack! I usually order this in restaurant but I’ve no idea why I haven’t thought of making it myself before. This will have to change since it looks pretty easy! Hi Sylvia! These are super easy to make, I’ve seen my parents make them for special occasions, though making them myself made me feel accomplished, hahaha! 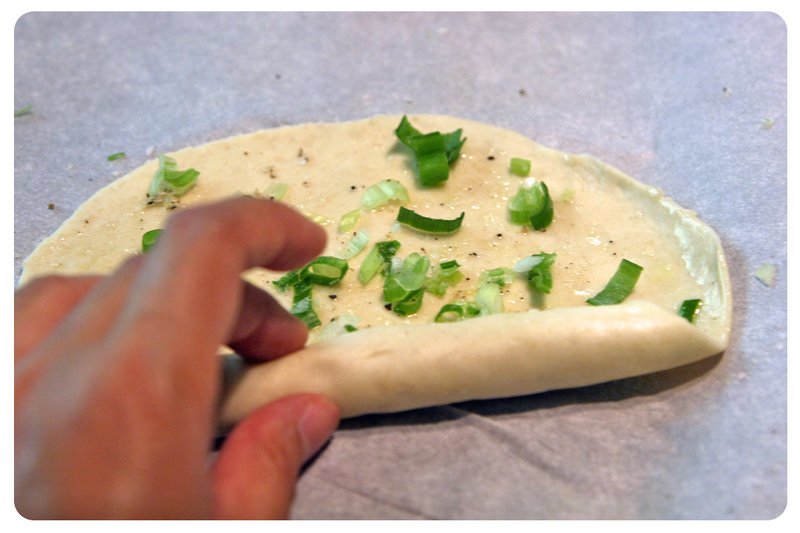 I think the next time I make these green onion pancakes, I will cut the dough pieces larger, and make them thicker. The thin ones are available premade in the freezer section, though I like the chewiness of the thicker ones, they taste a lot more authentic, like the way my parents make them! Your pancakes look really delicious and well done! We seldom ever get to try Northern Chinese food and though I have heard of this, I don’t remember having tasted it. I should give it a try. Hi Biren! Thank you for the rolling pin tips! I had no idea Tupperware makes them, gotta go do some online shopping after replying comments! My Mom was trying to give me one of hers, I told her I don’t want to take this essential tool away from her and my Dad, because I’ve seen them rolling out dumpling skins together, it’s adorable! This is one of my favorite pancake to eat, I prefer savory over sweet anyday! I have not been to China, though my parents just got back from a 2 months trip, I can imagine you must have eaten a lot of delicious foods that’s not available at Texas. I am surprised at how easy these green onion pancakes were, I did get all sweaty making them because the kneading required energy, though the end result was totally worth it! I’m so sorry it’s taken me so long to drop by your blog~ Things have been so crazy for me at work, with the blog and just life in general! How wonderful would it be if we were able to not work 😛 and just do what we want all day long! Belated Happy Birthday to your Father!!! It’s always nice to have the excuse to cook and make something special for your loved ones hehe! My Dad is from the Northern part of China too and they sure like their carb loaded breads! 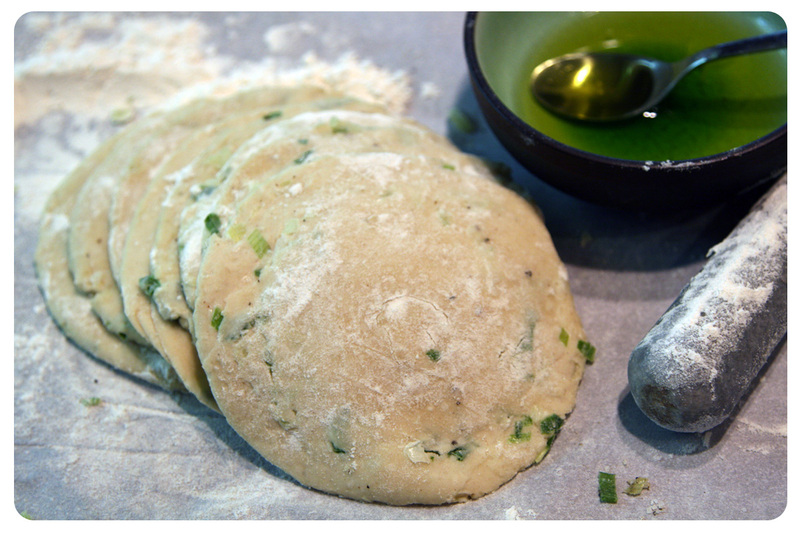 🙂 these green onion pancakes look amazing and very authentic too ~ best thing is I have all the ingredients at home hehe think it’s time i gave it a go 🙂 WOO HOO! Thanks for sharing! Hope you’ve sorted your fridge issues and have a wonderful week! Although I didn’t grow up in Northern China, I’ve also been a fan of all kinds of flour-based dishes! 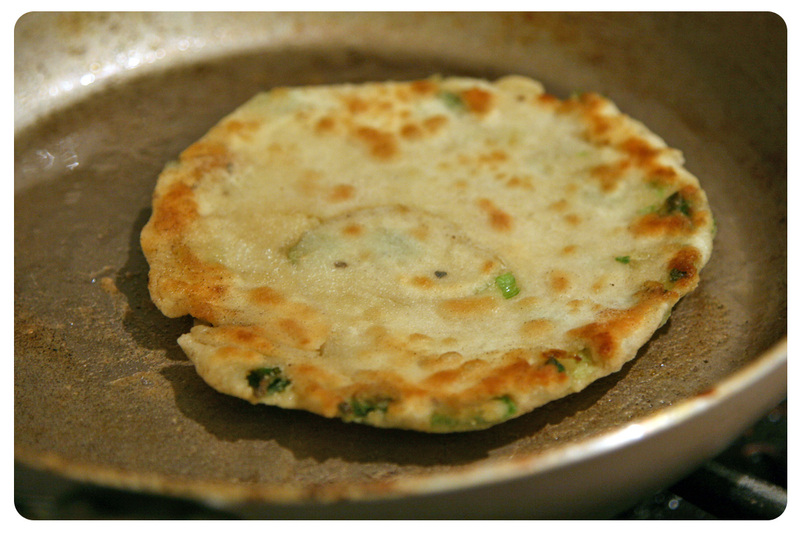 Scallion pancakes has always been a comfort food and I used to have them as breakfast with soy milk (long time ago though). 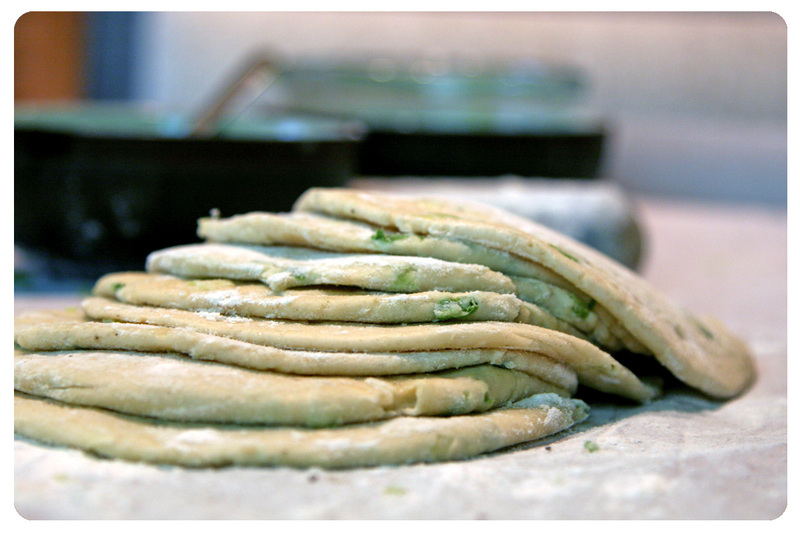 Thanks for sharing your perfectly made scallion pancakes! Hi Yi! I am a total sucker when it comes to flour based food, they are just so comforting! I love having Chinese style breakfast with hot sweet soy milk also, brings back wonderful memories of my childhood back at Taiwan! I love these little treats. What a great tip on rolling them and then flattening them so that all the yummy spring onions get mixed in well. This is a great after school snack! YUM!!! I’m going to have to make these ASAP! They look so good! Hi Thank you for visiting! I am envious of folks from Australia, looks like there are so many wonderful restaurants there to explore! I love green onion pancakes! I’ve never made them before so thanks for sharing this recipe! They look delicious! Hi MJ! Thank you so much for visiting! I really had a great time making those pancakes, and the family members were happy eating them. The little kids kept on asking for more, it was hilarious! Hope you will give it a try also! These look delicious! Green onion pancakes would get wiped out at my place. Thanks for sharing. Thank you Asmita for dropping by! The family wiped them out in record time, though the next time I will try to make thicker and bigger ones, that’s my preference. Have a good weekend! Thank you for visiting Sammie! You should give it a try, it does take a bit of elbow grease, but not difficult at all. 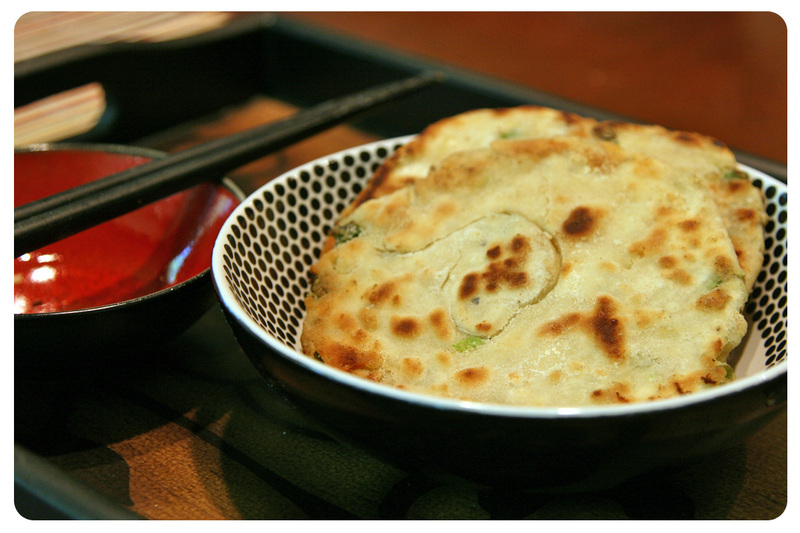 I bet you would love eating home made green onion pancakes! Hi Jeno, I’ve never made green onion pancakes at home since I’ve always thought it is a lot of work kneeding the dough. But this recipe does not look so bad. We usually order these pancakes in restaurants when they are available and perhaps I can try making this at home one day. Hi Sharon, this is not hard to make at all, and so yummy! We almost always order it when we eat at Chinese restaurants, though the home made ones usually taste healthier and yummier! Hi Charlie, thank you! I love them also, and we eat them often (though not the home made ones)… Glad to connect through FB, I have not blogged for a long while due to the whole flooding, house is getting renovated and kitchen will be unusable for a while. FB is the only place I update often, so stay tuned! This is such a fun space to be & thks for sharing your story! Honestly, I haven’t tried pancakes with green onions before. It’s so interesting. I’m glad I stumbled upon your blog 🙂 Following u at Pinterest now & would love to have u follow me too. Looking fwd to sharing, not just on our cooking! Hi Shirley, thank you so much for visiting! Surely you can tell I have not posted for quite a while, partly due to laziness, though mainly due to my house renovation. The process is almost complete, which means I will start cooking/sharing again very soon. Meanwhile I’ve liked your FB page, also started to follow you in Pinterest. Looking forward to see more! Love how crispy and delicious these look! They look (dare I say) even better than the pajeon I’m accustomed to! Oh thank you so much for your kinds words! I worked up quite a sweat making those green onion pancakes, though they were totally worth it to see my Dad’s smile, while eating his favorite carb! Oh my goodness, I put green onion in everything, so this is right up my alley! This looks great! Thank you Cathleen for visiting! I hated the taste of green onions as a child, the mere smell of it made me gag. Who knew my taste buds would make a 180 turn around. Now a days I put them onto almost any savory dishes I cook. Yum! I will be checking your recipes out very soon! i recently made a big batch of these and froze them for a continuous supply on hungry and lazy nights! so simple and delicious! That is a great idea! I see them in the frozen isles in the Asian super markets, though home made is always best!